I had gather 10 000 USD in two year, which for Portugal standards is a considerable amount, especially if you have a young family to support and you just saw your pay-check cutted to less than 1500 USD per month. As I said before I would trade stock’s CFD because of the leverage that I could achieve, which meant that I would have about 100 000 of total funds to invest. Pretty nice, hum? I also establish that the most I could loose from my total capital was 1000 USD or 10% if you prefer. This rule was my first and I tried to be the strongest rule. If I would lost that amount of money I would stop for somes months for rethink my strategie. But for sure that would not happened. I also defined that I would buy 10 equities shares for some diversification and mitigation of risk. I would buy 7 longs and sell 3 shorts, based on the 130-30 portfolio strategie because at the time I had read a paper that this was the way to have better returns with smaller risks. I started looking for blue chips that were near highs, because if they are near all time highs there is a great possibility that they will go higher. In opposition, to go short I chose stocks that were in a downtrend and were making new lows. I also looked for stocks in uptrends that were near 50-day moving average for a buy and stocks that were under 200-day moving average for a sell. I even used screeners that gave me a complete list of stocks in similar situation. The idea was to catch major trends “à lá turtles” way. Real simple plan that I could easily understand it and mastered it. I also tried to diversify geographically my stocks, because there are some differences between countries’ economic cycles and therefore I was reducing my risks. Money management took me a great part of my learning. I know that in this game I will lose money. It’s part of the game and you must accept it, but It was a non-option to lose all my capital and my 2 years effort in saving that amount of money. It would be a great failure and the emotional pain would be so devastating that I probably would never look again for stocks’ investments. So I look at money management as my safety net. My money management was really simple I would pick a stock that would meet my predefined attributes. Then I would identified a low point near 50 day moving average or some new higher low on the uptrend movement. Here I would define my stop area and I would tried to buy the nearest I could from this point. 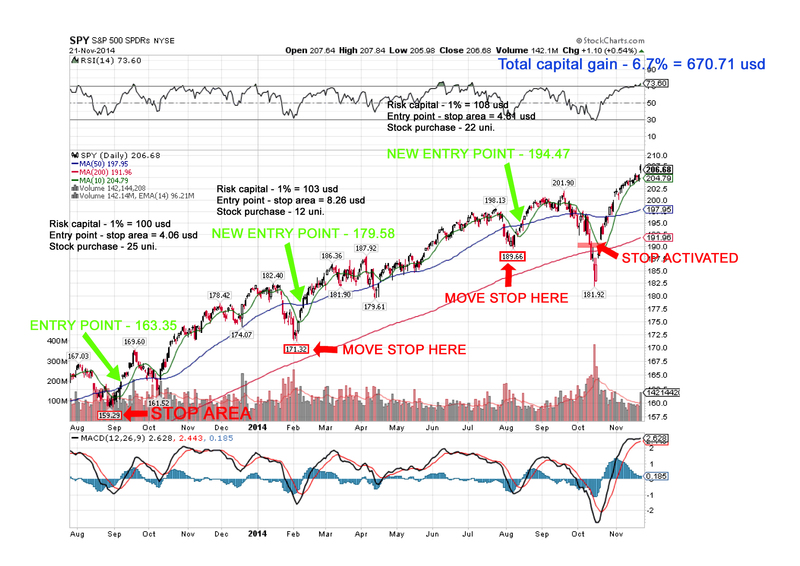 The difference between my entry and stop point would be the equivalent of 1 to 3% of my total capital. This was the amount of money that I decided that I could loose in a single trade. This implied that I would have little space for error because I would stop trading If my losts achieved 10% of my total capital. Nevertheless I was confidence that I could have success. On the other side, I established if I had correctly spotted a stock’s uptrend I would take advantage of market corrections and I would buy more of that stock, maintaining the same risk. Let always make your profits run, professionals say. And this is very simple to do. Imagine that you bought stock and you risk 1% of your capital. After few months, you have a possible profit of 20%. Meanwhile the stock enters a corrective phase and the price falls 8%, not going lower than the previous time (where you had established your first stop), making a new lower high. Then if it rebounds that means that the worst has passed and the uptrend is still intact, therefore you can move your stop to the new lower high area. This means that you are not risking 1% of your capital anymore and you have a profitable trade. Now you can raise your position size on that stock, maintaining the same initial risk of 1%. This can really boost your profits. I didn’t take much time thinking on this. Now I know that is an important part of a strategy. By then I thought that I would go with the flow, as long as the trend lasted. This was my approach to take my fare share of what markets have to give. A simple plan because reality is so complicated that you shouldn’t add more layers of complicatedness. In 2010 I was expecting my second child and I started to wonder what could I do to improve my family’s income. Not because my income was not enough, but mainly because I wanted to insure a steady future for my family, where my kids, my wife and me could have plenty of options to decide big family’s dilemmas, such as “should our kids study abroad?”, “should we move to a bigger house?”, “Am I saving enough for retirement!?”. And if you want to have a wide range of option, money certainly helps. With such wishful thinking overflowing in my head I started to read books about technical analysis and differents styles of trading. I also became a regular visitor of trading blogs and forums. I was really curious and passionate about trading and I wanted to learn the most I could. I learnt about charts, moving averages, RSI, MACD, support and resistance lines, long, short, swing, momentum and day trading, options, CFD’s, ETF’s, money management and psychology, psychology and psychology. Finally I got it, I needed to be psychology strong and to have some kind of money management that would allowed me to preserve my money from myself (Good lessons by the way). I also decided that I would be a long-term follower trader and I would trade contracts for difference (CDF’s), a trading instrument that is a financial derivative and is not available in US, due to restrictions by the US Securities and Exchange Commission on over-the-counter financial instruments, but allows you to have a leverage ratio of 10:1 in stocks, which was what I needed because the initial capital wasn’t much. In 2011, after I spent one year studying and getting ready to trade, Portugal went almost bankruptcy and needed to go under EU/IMF/ECB financial assistance programme. For me as a government employe was a setback because I saw my wage shrinking. This made me re-thinking my expenses and investments and gave me more strength to learn more about investing. Nonetheless, I got real upset for seeing my pay-check cuted, I understand the implications of being a public worker, furthermore in Portugal where is real hard to get sacked in public administration. But I had always been a pretty good worker, skilled and honest, why should I have to pay for a bureaucratic, bad managed and sometimes corrupted public administration? I have not, as my liberal friends tend to tell me “If you are not glad go and find something else”, but the private sector was also hit hard and jobs got scarce. Anyway I was still in comfortable position, living near work and able to see my priority investments growing up, my kids. Why should I bother to be good at investing if can’t raise properly my children? Their are in fact my most important and valuable assets. So if I try to be the best father I can and give them love and a good education, probably in the future I will avoid a lot of headaches and money thrown out of the window. ‘Prepare today your future investments’.